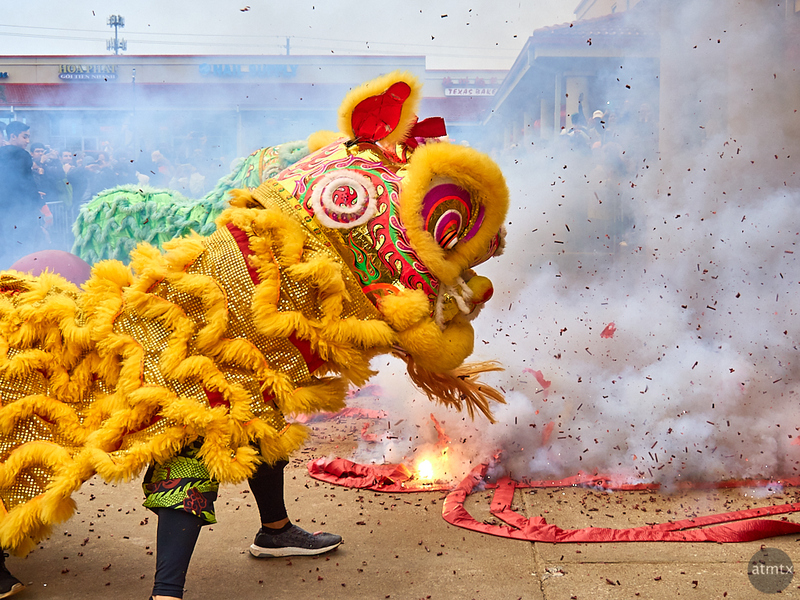 The official Chinese Lunar New Year was January 28th, but the big celebration in Austin happened this past Sunday. I was there at the Chinatown Shopping Center, early, with two cameras in hand. It’s always a challenge to figure out which cameras and lenses to bring. Part of it depends on the logistics of the shoot and the kind of photos I want to take. The crowds continue to increase and they’ve started to place barricades around the Lion Dance area, undoubtedly to protect us from the firecrackers. The whole affair seems more structured now, than it was in the past. Even the Fire Marshall was there to make sure the event adhered to code. But it worked out well and the added structure may have helped somewhat to get this shot. It’s always a crap shoot capturing a nicely posed Lion with visually attractive firecrackers. The crowds now add unwanted background clutter but sometimes you get lucky and the smoke acts as a screen which simplifies. I’ve shot this event for a number of years, with a variety of cameras in a variety of styles, and it’s still fun. This year, the Olympus E-M5 Mark II along with the versatile 14-150mm, which I used here, served as my general purpose camera. The other, the Olympus PEN-F, was reserved for an experiment of sorts, the results of which, I will post soon.